Urdu Media Monitor is a news monitoring site which aims to make urdu news available to non-English speakers in India. 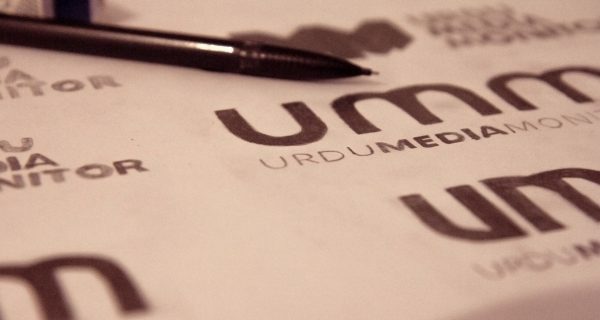 Urdu Media Monitor had begun as a small project started as a hobby, and so the logo was generic and (in the words of the editor) “embarrassing”. The site’s audience eventually grew over time and the editor decided that it was time for a change. Initially, the client wanted a logo which incorporated Urdu lettering, but after some discussion, we decided that this was not appropriate as most of the site’s audience could not read Urdu. However, I still wanted a subtle nod to Urdu lettering, I decided to try hand lettering a logo reminiscent of Urdu typography. After studying Urdu typography, I realised that many letters have sharp corners, as well as some variation in stroke width. I therefore created a logotype which incorporated these aspects. The end result was a clean, modern logo which gave the company a much more professional look.